Summary: The Gulf Specimen Marine Lab will to develop and display an educational interactive kiosk on the life history of Florida sea turtles. This new exhibit will combine audio, slides and video clips. Visitors will learn about the food chain, what turtles eat, and what creatures preys on sea turtles. As visitors to our aquarium stroll among existing life sized fiberglass models of a leatherback, hawksbill, green, loggerhead and Kemp’s ridleys that hang from the ceilings, and view the static graphic displays, they will also be able to look at video clips, slides and audio that describe where sea turtles live, what they eat, and learn about the threats facing them. Gulf Specimen is a permitted sea turtle rehabilitation center. Occasionally visitors are lucky enough to see turtles being tagged, weighed and measured, or even being fed live prey such as jellyfish, mollusks, crabs and algae prior to the turtles’ release into the wild. However, with the multimedia capabilities of today's computers that virtually process information from photos, video, audio and textual data and sequences with voice explanations, watching turtle rehab events can become an every day experience. 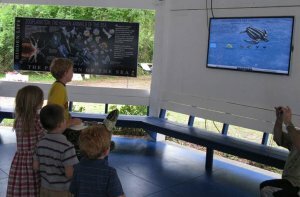 Results: Gulf Specimen Marine Laboratory now has an interactive sea turtle kiosk that focuses on what sea turtles eat and where they live, and keys the organism in their diets to living exhibits in the aquarium. It delineates the food chain, and demonstrates that sea turtles are an important part of the food chain. Such information has been made available on the internet, and the introductory film on the kiosk is now posted on youtube. We have been told by their teachers that it is a successful educational too and a valuable addition to other sea turtle exhibits at Gulf Specimen’s facilities.